Unlikely Duo Join Forces On Sentencing Overhaul Bill : It's All Politics An unlikely pair of senators — New Jersey Democrat Cory Booker and Kentucky Republican Rand Paul — are teaming up on a bill that aims to fix America's criminal justice system. 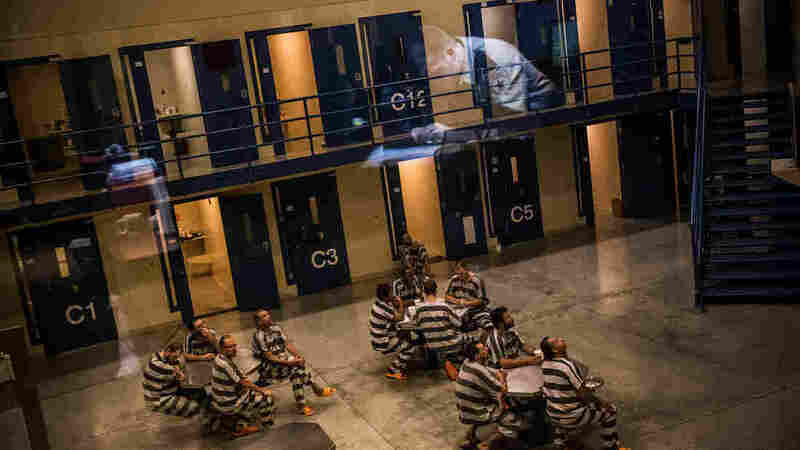 An officer is reflected in the glass as inmates sit in the Williston, N.D., county jail in July 2013. Two senators — a Democrat and a Republican — introduced a bill Tuesday that aims to overhaul the nation's criminal justice system, slash government spending on prisons and make it easier for nonviolent offenders to find employment. Sen. Rand Paul, R-Ky., and Sen. Cory Booker, D-N.J., both freshmen looking to elevate their national profiles, are teaming up to unveil the REDEEM Act, which stands for Record Expungement Designed to Enhance Employment. "The legislation will help keep kids who get into trouble out of a lifetime of crime and help adults who commit non-violent crimes become more self-reliant and less likely to commit future crimes," the senators said in a joint statement. For juveniles, the bill calls on the handful of states that can try minors as adults to lift the minimum age of criminal responsibility to 18. It also seeks to automatically expunge records of kids who have committed nonviolent crimes before they turn 15 or have those records sealed if the nonviolent offense happened after 15. In addition, the measure calls for the curtailing of juvenile solitary confinement in most cases. For adults, the bill would create a system by which a nonviolent offender can petition a court to have his or her criminal record sealed — which would help shield an offender's record from an employer-requested FBI background check and make it easier to secure employment. According to the American Civil Liberties Union, the U.S. makes up 5 percent of the world's population, but has 25 percent of the world's prison population. And it says since 1970, the U.S. prison population has increased by 700 percent. "The REDEEM Act will ensure that our tax dollars are being used in smarter, more productive ways," Booker said via statement. Since being sworn into office last year, Booker has made it a point to reach across the aisle. In April, he worked with South Carolina Republican Sen. Tim Scott on legislation aimed at finding jobs for young minorities. Paul, who is expected to run for the White House in 2016, has been working to make inroads into communities that don't typically vote Republican. And in June, he pushed a bill that sought to restore voting rights in federal elections to felons who committed nonviolent crimes.